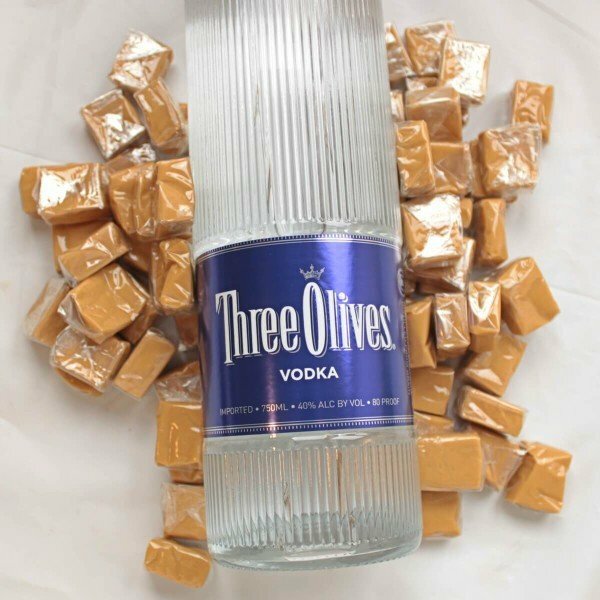 Inspired by the popularity of salted caramel as a flavor, I started wondering what it would taste like if you infused vodka with chewy caramel candies and just a touch of salt. Sure, you can buy salted caramel flavored vodka off the shelf, but I prefer infusions because they keep the essence of what you’re infusing them with. This is my Salted Caramel Vodka infusion. For the caramels, I used First Street, which is the brand for the huge bags of candy they sell at Smart N Final, and they had a very good flavor and texture. 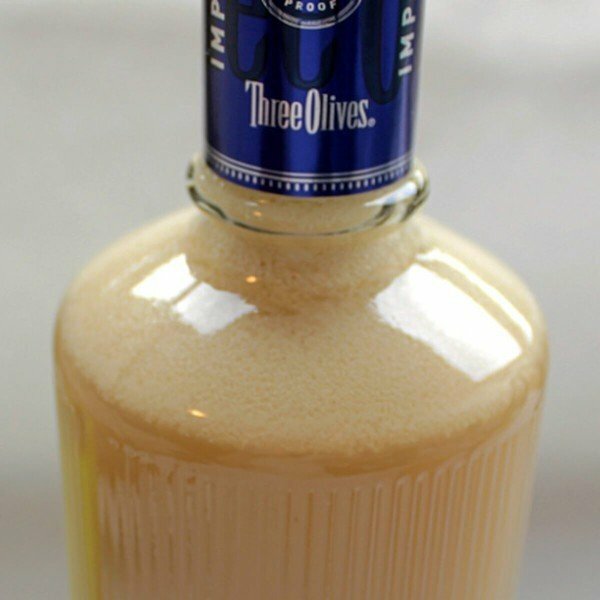 For the vodka, I went with Three Olives because this recipe needs a vodka that’s smooth and drinkable on its own. For the salt, anything will do but I used sea salt from Trader Joe’s. Then I unwrapped them and, looking at how narrow the neck of the vodka bottle is, I chopped each one in four. This also helps it infuse faster, because there’s more surface area for the vodka to touch. Looking at them, I made a guess about how much of the vodka in the bottle they would displace, and poured myself a shot of vodka, which I enjoyed while I worked. It turned out this was exactly the right amount of vodka to pour out. 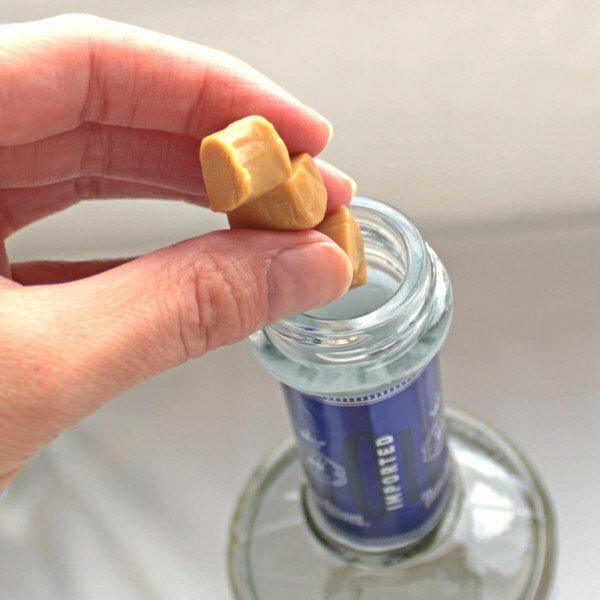 Then I stuffed the caramels into the bottle. Once they’re all in, they tend to clump at the bottom of the bottle. You could stop here, but I wasn’t wild about the white frothy stuff at the top. I’m not sure what it is, probably an additive from the caramel candies, but I just wanted the whole thing to be perfectly uniform. 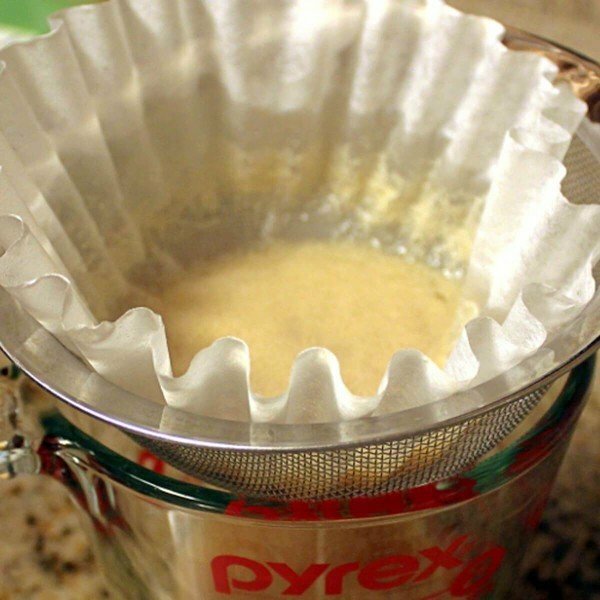 So I strained it once through a coffee filter. 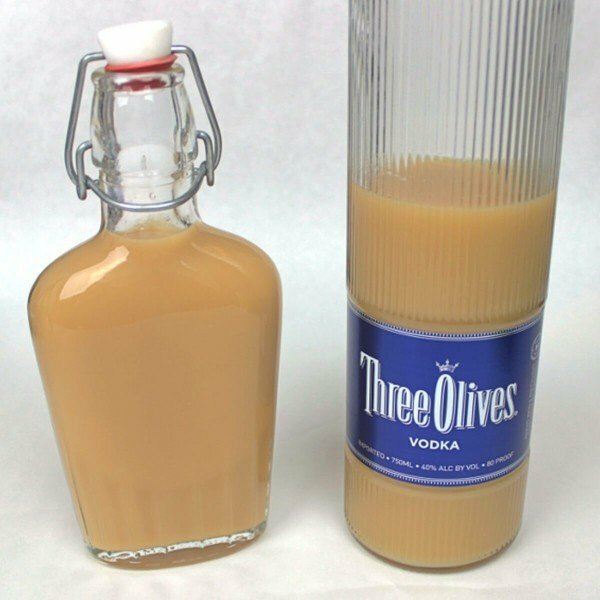 Unlike the Skittles Vodka Infusion, I found it worked best if I poured a few ounces through a filter, then swap out a new filter for the next few ounces. Otherwise, the frothy stuff would clog up the filter and make it slow. At this point, I cleaned the original vodka bottle. It actually took some Dawn to get out all the white gunk. Then I poured the strained infusion back into the clean bottle. Then I added a pinch of salt – seriously, that’s part of an eighth of a teaspoon. Do not get too much! You can always add more later, or even add it to drinks individually. You can also rim the glasses with it. And there you go – the finished Salted Caramel Vodka. Since people always ask, you can buy these flasks from Amazon. So how does it taste? Like caramel sunshine. It’s sweet, but not as much as I expected. 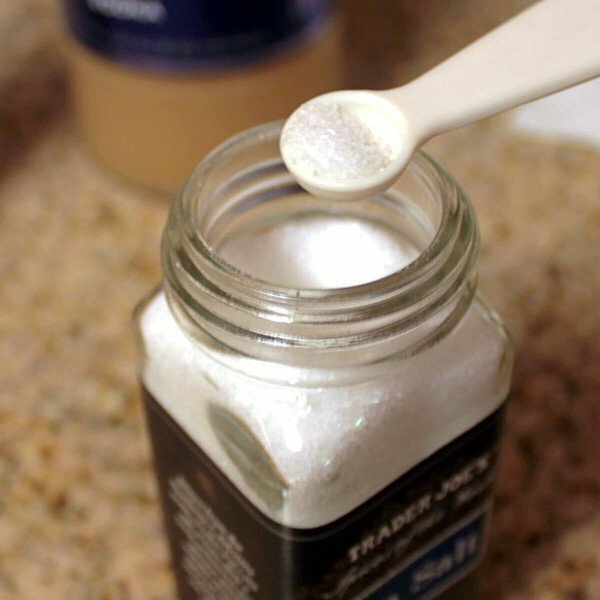 You don’t taste the salt itself – it cuts the sweetness and enhances the flavor. Mainly, you get this buttery caramelized sugar flavor that’s strong but not heavy. It’s lighter than, say, Baileys or Kahlua. The goal had been to create something that was sweet but sophisticated, and this surpassed my expectations. Of course you can make it more or less sweet depending on the number of caramels you use. But it’s also great in cocktails. Be sure to try it in the Caramel Candy or William’s Caramel Appletini! This sounds great! I’m wondering if perhaps the white residue is milk or fat solids? 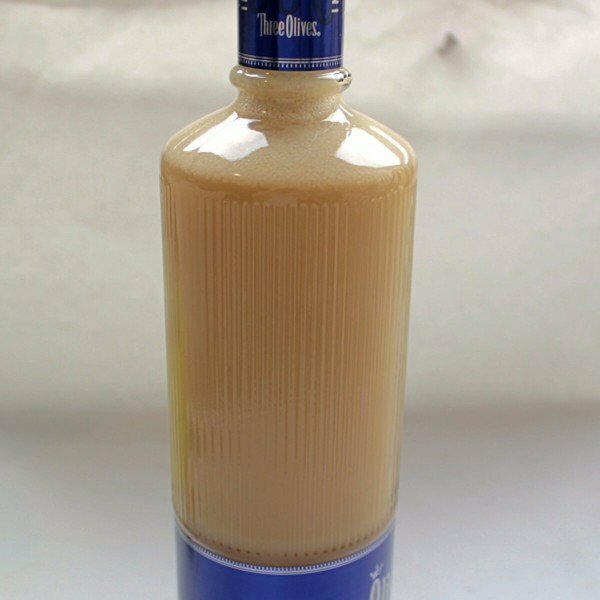 Not sure if you used full cream or butter caramels but I would think that the alcohol would cause some separation to happen? You’re probably right. The ingredients list is for the ones I used (First Street, Smart n Final’s brand): sugar, corn syrup, skim milk, hydrogenated vegetable oil (soybean, cottonseed and/or palm kernel oil), whey powder, milk cream, salt, soy lecithin, mono- and diglycerides, vanilla flavor. So unless one of those oils or the whey could have caused it, it probably is the milk. It doesn’t taste like much of anything on its own. Two questions: Firstly, how many days does this overall process take? Will it be ready in time for Christmas if I start tomorrow morning? 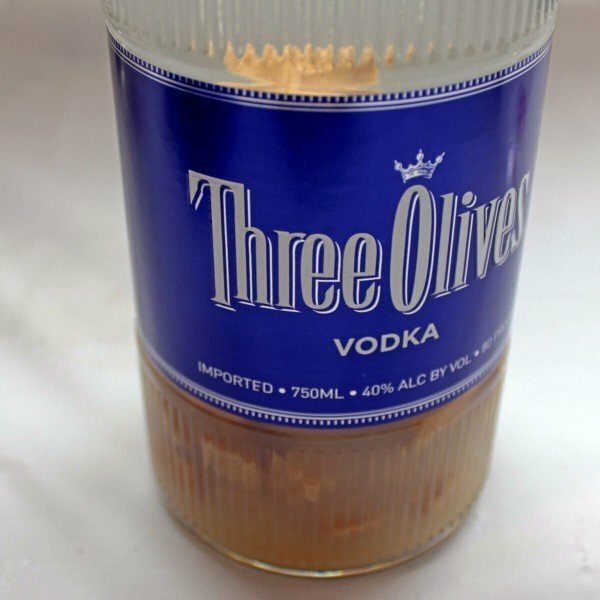 Secondly, how does this compare to the commercially available caramel vodkas like Lovoka and Smirnoff? My father had Lovoka recently and is still going on about it so i thought I’d make him a little bottle (i can’t find small bottles in stores here and the big ones are ridiculously expensive). But if it doesn’t taste similar, he’ll probably hate it because he’s fussy as hell and hates most alcohol. It takes a couple of days at most. If you can shake it several times a day, it’ll probably done in 36 hours of less. As for comparison, the flavor here is more subtle and the texture is just a little bit more creamy compared to the flavored vodkas. I strongly prefer this recipe to the commercial bottles, but if he loves the commercial stuff, it’s hard to say. Brilliant recipe, Jen! Thank you. About the time frame though, it’s easy to speed it up multifold and have the thing done in just a few hours. 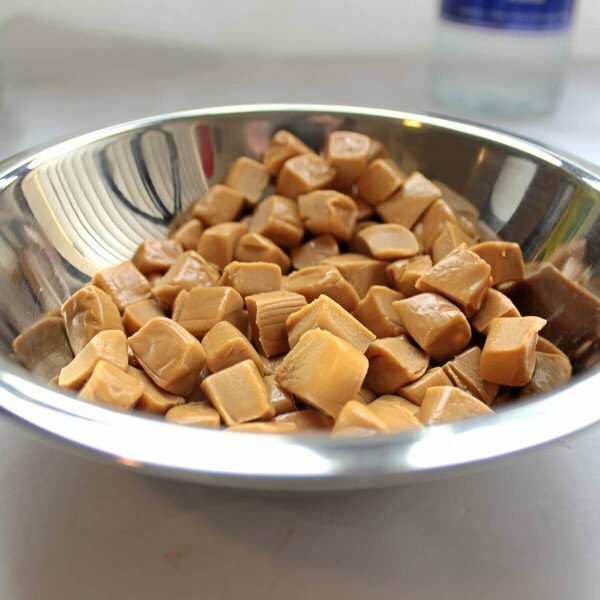 First, don’t cut the caramels but grate them – the lesser the pieces the easier they dissolve. Aha, great tips! Thank you! Great tip, Diane! This really does speed it up. 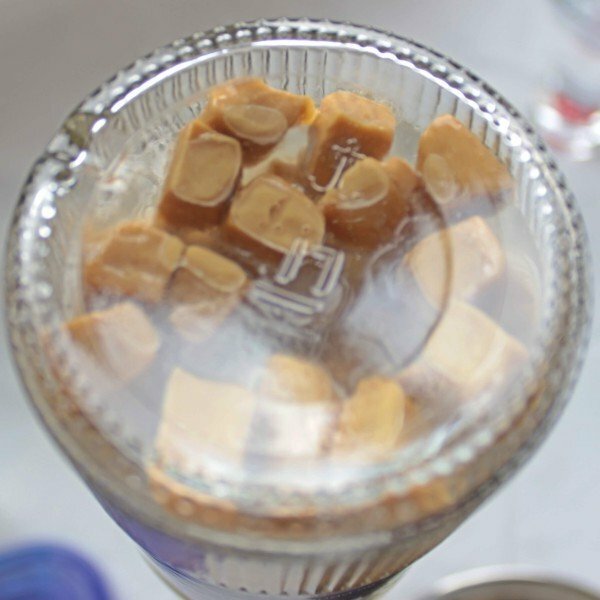 I’m wondering about using caramel topping (for ice cream) rather than candies…less dissolving? That’s a good idea! I’ll try a batch that way sometime! We are at 48 hours…..Do you have to refrigerate this during the infusion process? Or if you have been refrigerating it during the process can you take it and let sit at room temp? I never refrigerated it, so you can definitely take it out. I wonder if refrigerating it might slow down the process. Does it have to be refrigerated and how long will it last? Because there is made from vodka and from candies that are shelf-stable (able to stay good without refrigeration for quite some time), it should be fine without refrigeration for probably months. 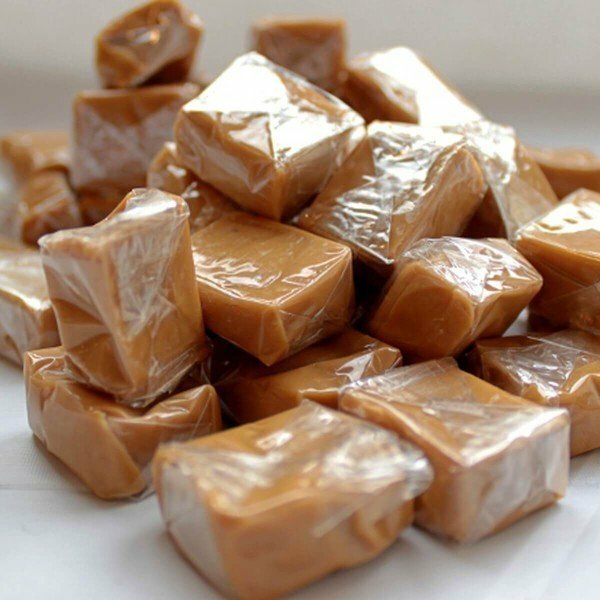 BUT there is a bit of dairy in the caramels – milk solids and so on. So just to be safe, I’d advise keeping it refrigerated as much as possible. But taking it on a long car trip to someone’s house, or leaving it out during a party – I wouldn’t worry about that. I’m totally hooked on anything caramel-salted these days, including my hot chocolate! Since the “pinch” of salt is so iffy, I was wondering if anyone has tried not salting the vodka mixture but salting the rim of the glass with a nice sea salt….like the salt a margarita. Anyone? Results? You’re brilliant! :D I tried this, and it’s REALLY nice. I also tried just sprinkling the salt right into the drink after you’ve poured it, and that works nicely too. Not quite the same “bite” as the salt rim, but it lets you salt it to taste. Put in shaker filled with ice and shake for 10 to 20 seconds……enjoy!! 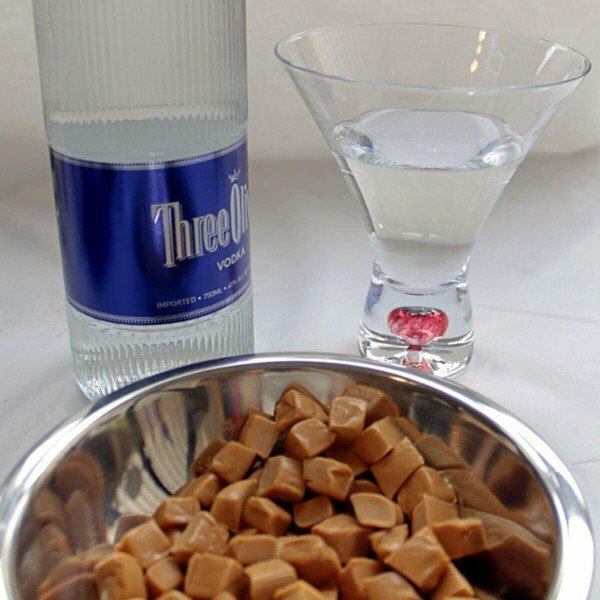 Variation….Use 1/2 ounce Cinnamon Jolly Rancher vodka/rum in place of Carmel for a Cinnamon Appletini! Either of these are just absolutely 1000% better using these home brews over the stuff you get in the store! Roughly how much did the caramels weigh? Or do you not think it really matters…? No, that’s a good question. 20 caramels = 150 grams. I just started this a bit ago. I was thinking of adding in 1/2-1 vanilla bean the last 12 hours or so of infusion/solvation. What are your thoughts on whether this will be a noticeable flavor boost or not? I think it’s worth a try! It might not make much difference, but I can imagine it adding some depth as well as a flavor boost. Hi there! Love the look of this and can’t wait to give it a go. Have you ever tried it with dark rum or another spirit? Would you use the same volume of caramel? I tried it with light rum, but one that had too much flavor and it clashed with the caramel. I think with a nice, mellow dark rum it could work very well. You might want to try a bit less caramel, say 1/4 fewer pieces just in case the rum adds to the sweetness. But I have a feeling the same amount as I used in this recipe will work. You can always add more caramels later. Or more rum, if it’s too sweet. Just made this last weekend, and it was ready in about 27 hours. It was great, just straight, but I made it use in hot apple cider. DELISH! It still separates but a quick shake makes it smooth again. Thanks for the recipe. Super easy! 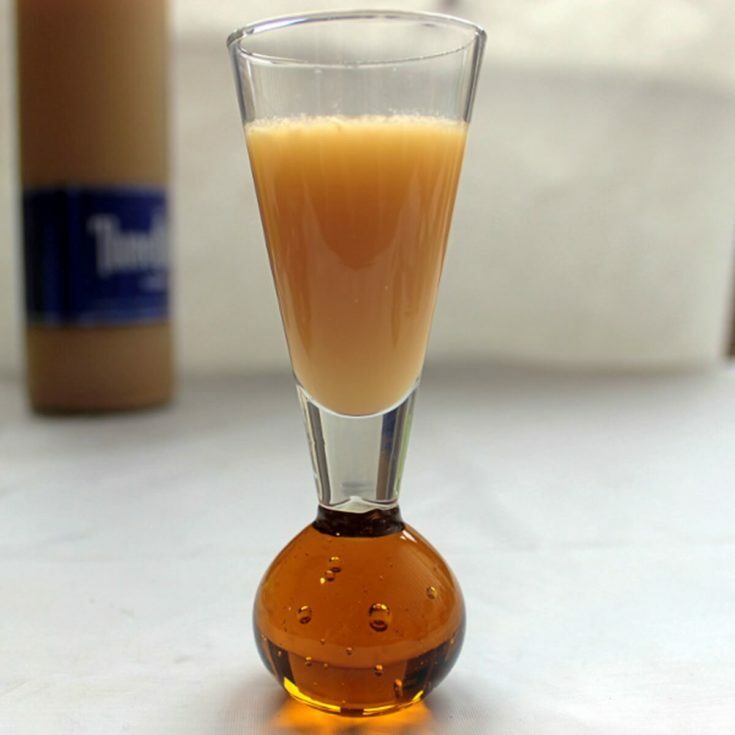 If you want to speed up the process, without effecting the drink. Please the bottle of vodka and sweets in the dishwasher with your pots on a normal wash cycle. The heat of the cycle will help to melt the sweets but not effect the alcohol. No, but I think that might be my next infusion! I did not get any white residue?! I used a large bag of the hard Werthers and it was awesome!!! How long did the infusion process take with the hard werthers candy? It sounds really good.